At 7 PM Central Time this evening (9/28/10) in Chicago, the Organization of Islamic Conference (OIC) Secretary General Ekmeleddin Ihsanoglu of Turkey will deliver a keynote speech opening a conference at the American Islamic College, entitled, “The Role of the OIC and The scope for its relations with American Muslims.” Bat Ye’or’s recent American Thinker essay highlighted the OIC’s agenda — consistent with the historical jihad imperative — global Islamization, or in modern parlance, totalitarian hegemony. A 1954 Diogenes — lamp in hand, in broad daylight, searching for an honest assessment of Islamic totalitarianism — would have been uncharacteristically rewarded had he read Bernard Lewis’ essay, “Communism and Islam.” [International Affairs,Vol. 30, No. 1(Jan., 1954), pp. 1-12] Currently, however, in his twilight years, Professor Lewis’ apologetics on Islam (discussed here, here, and here) are but a simulacrum of the uncompromised views he recorded over 56 years ago. Alas, Professor Lewis’ “transition” is profoundly disappointing, and would only confirm the classical cynicism of a Diogenes, circa 2010. …Quite obviously, the Ulama of Islam are very different from the Communist Party. Nevertheless, on closer examination, we find certain uncomfortable resemblances. Both groups profess a totalitarian doctrine, with complete and final answers to all questions on heaven and earth; the answers are different in every respect, alike only in their finality and completeness, and in the contrast they offer with the eternal questioning of Western man. Both groups offer to their members and followers the agreeable sensation of belonging to a community of believers, who are always right, as against an outer world of unbelievers, who are always wrong. Both offer an exhilarating feeling of mission, of purpose, of being engaged in a collective adventure to accelerate the historically inevitable victory of the true faith over the infidel evil-doers. The traditional Islamic division of the world into the House of Islam and the House of War, two necessarily opposed groups, of which- the first has the collective obligation of perpetual struggle against the second, also has obvious parallels in the Communist view of world affairs. There again, the content of belief is utterly different, but the aggressive fanaticism of the believer is the same. The humorist who summed up the Communist creed as “There is no God and Karl Marx is his Prophet!” was laying his finger on a real affinity. The call to a Communist Jihad, a Holy War for the faith-a new faith, but against the self-same Western Christian enemy-might well strike a responsive note. The elected Board of Education in the state of Texas today adopted a resolution that warns textbook publishers to be careful and provide fair treatment of the world’s religions – or face being snubbed by the state that buys more textbooks than any other. Jonathan Saenz, director of legislative affairs for Liberty Institute, told WND the vote “sends a strong message that Texas state board members, and really speaking on behalf of the people they represent, care about keeping textbooks accurate. “They are against religious discrimination. That sends a message,” he said. He said the board, whose members are elected by voters, are serving their responsibility to be a “check” on the products being used in the state’s schools. The resolution discusses world history textbooks officially adopted for use in Texas between 1999-2002, which may still be in some classrooms. The resolution also discusses textbooks used in other parts of the country. In Texas, world history textbooks are used at the high school level. One book that was examined was “World History, Patterns of Interaction” published by McDougal. The footnotes noted that it has been reported that the Dubai royal family was a “major shareholder” in the Education Media and Publishing Group, which controls textbook publisher Houghton Mifflin Harcourt. Rives also noted the prominent national role Texas plays in textbook disputes. DMN’s Terrence Stutz reported that the resolution “offered no specific evidence of such investments,” despite the footnote regarding the Dubai royal family. As WND previously reported, American public school textbooks have been used to promote Islam, and publishing company executives are primarily responsible for the content of the texts. This time, I’ve had it. While “outrage” has been pretty much the key word this summer, my own reached its upper limits with the news that cartoonist Molly Norris had been forced into hiding by a fatwa threatening her life for an idea: to establish “Everybody Draw Mohammed Day,” on which the world would sketch images of the Prophet Mohammed in defiance of efforts by Muslims to censor such images, and, in some cases, to murder those who created them. Norris’s suggestion came in response to a decision by executives at Comedy Central to censor the satirical show, “South Park,” which aired an episode that joked about showing Mohammed dressed in a bear suit. Well, not to religious Muslims, who, unable to distinguish fact from fiction or truth from allegory, view parodies of their holiest figure as an assault on Islam itself. We’ve encountered that kind of ignorant hate before, of course – most famously in the case of the so-called “Danish cartoons,” created by cartoonist Kurt Westergaard for Denmark’s news daily, the Jyllands Posten. In that case, not only was Westergaard targeted for assassination, but Danish and other Scandinavian embassies across the Middle East were torched, and violent demonstrations left numerous people dead. Apparently, the FBI doesn’t think so, either; and here is where my outrage boiled over. Cautioning Norris to take al-Awlaki’s threat seriously, they have now advised her to change her identity, move far from her home in Seattle (where she, until now, worked for the Seattle Weekly), and start over – essentially entering into a witness protection program – only without the accompanying protection. Let me repeat: The U.S. government is suggesting that Ms. Norris change her name, strip away her past, possibly even change her appearance, because she has been targeted by Muslim extremists who are not amused by her work or her ideas. Rather than protect her, rather than defend her, rather than stand up for her Constitutional and democratic rights, declaring their intention to route al-Awlaki out and bring him (and others who are threatening her life) to justice, the American government, as it were, is itself in essence allying with him by taking away her freedom and her life . And here’s the kicker: it’s likely not that hard to find Al-Awlaki – who has been linked to the Fort Hood massacre, the so-called “Christmas bomber,” and the attempted bombing of Times Square. Anwar Al-Awlaki, born in Las Cruces, New-Mexico, is a citizen of the United States. And yet, unlike the British, who for years protected and defended Salman Rushdie from the edicts of Ayatollah Khomeini and others, the USA has thrown up its hands, leaving her to her own devices, the victim of the same sick Islamic ideology that permits women to be stoned to death for the crime of having loved. And so it becomes clear: If we are not involved in a physical war against Islam, we certainly are engaged in an ideological one. And as a woman with a secular, democratic ideal runs, now, for her life, the knights in armor assigned to save her stand aside. This is how we protect our values? This is what has become, now, of America? That even the suggestion “Draw Mohammed” can cost a woman’s life and the Federal Bureau of Investigation will do nothing? That even the voicing of a threat has America putting down its arms? We have spent untold billions of dollars in Afghanistan and Iraq at the cost of more than 5,000 US lives. And all the Islamic militants had to do to conquer us was speak. Such is the power of the word: and America now sits silenced, silent, dumb. Although many won’t admit it, we are in the midst of an ideological war with Islam. And since the advantage goes to the side that fully realizes they are at war, the West is losing. The propaganda war is going in favor of Islam precisely because the West doesn’t realize it is supposed to be fighting one. The ability of Islam to rally much of the world behind its hatred of Israel is a telling indication of who is winning the war of ideas. As for war aims, it’s not clear that there are any. Even those who see the danger clearly rarely talk in terms of victory; they talk mainly in terms of resisting cultural jihad. You know you’re in trouble when your ideological opponent is a primitive seventh-century belief system, and yet the best that your top strategists hope for is to put up a good resistance. As the Dracula-like return of Communist ideology demonstrates, an ideological war needs to be fought to complete and total victory. The enemy ideology should be so thoroughly discredited that no one—not even its former staunchest defenders, not even the most doctrinaire college professor—will want to be associated with it. In regard to Islam, then, our aim should go beyond simply resisting jihad; it should be the defeat of Islam as an idea. But, aside from inflicting crushing military defeats on Islamic powers, how do you accomplish that? One answer is that you do all you can to force Muslims to question their faith in Islam. As Mark Steyn observes, “there’s no market for a faith that has no faith in itself.” He was speaking, of course, of the more mushy versions of Western Christianity—the post-Christian Christians who seem anxious to dialogue themselves into dhimmitude. But there’s no reason the concept can’t be applied to Islam. Surely the average intelligent Muslim has occasional doubts about the founding revelations. And just as surely he keeps them to himself, not only because he fears his fellow Muslims, but also because the rest of the world seems to be going along with the pretense that he belongs to a great religion. It may be time for the rest of the world to drop the pretense. If one of your opponents’ core beliefs is that you need to be subjugated, why wouldn’t you want to foster doubts in his mind? Jihadists commit jihad because they correctly perceive that their religion calls them to it. As long as they are kept secure in the illusion that their faith is unassailable, they will continue the jihad by whatever means seem most expedient. They won’t question their faith—and neither will the majority of Muslims—unless they get used to the fact that it can be questioned and criticized. One man who has done a lot to shake up the faith of Muslims is Fr. Zakaria Botros, a Coptic priest who hosts a weekly Arabic language TV program watched by millions of Muslims around the world. Among other things, the engaging Fr. Botros forces his Muslim audience to confront unflattering facts about their prophet. He also talks to them about the Christian faith—something that most Muslims know very little about, beyond some simple caricatures. Apparently he is very successful at what he does. According to reports he is responsible for mass conversions to Christianity. Does such questioning of Muhammad’s character provoke anger among Muslims? Well, yes, it does. The elderly Fr. Botros has been labeled Islam’s “Public Enemy #1,” and a reported $60 million bounty has been put on his head. But, according to a recent piece by Raymond Ibrahim, “the outrage appears to be subsiding.” Ibrahim contends that Life TV (the satellite station that carries Fr. Botros’ program) “has conditioned its Muslim viewers to accept that exposure and criticism of their prophet is here to stay.” The first time a Muslim hears the moral flaws of the Prophet exposed, he may well be angry at the exposure. But how about the third time? The tenth time? The twentieth time? What initially provokes anger might eventually provoke doubts about Muhammad’s claims. I was born into a mildly observant family in Iraq. At that time, the 1950’s, secularism was ascendant among the political, cultural, and intellectual elites of the Middle East. It appeared to be only a matter of time before Islam would lose whatever hold it still had on the Muslim world. Even that term—“Muslim world”—was unusual, as Muslims were more likely to identify themselves by their national, ethnic, or ideological affinities than by their religion. Deeply rooted? Perhaps you’ve seen that sequence of photos of the University of Cairo graduating classes for the English Department. The women of the Class of 1959 look like college students anywhere in the Western world circa 1959. They wear Western style skirts and dresses and no head covering. Ditto for the class of 1978. It could be the class of ’78 at the University of Chicago. But by 1994 half the women are wearing hijabs. By 2004 almost all the women are wearing hijabs and ankle-length clothing. So, sometime in the 1990’s educated Muslims apparently began to take their faith more seriously. They appear to take it very seriously now. But how “deeply rooted” is twenty years? Given that the penalty for leaving Islam—or even criticizing it—can be death, we may be mistaking deeply rooted fear for deeply rooted faith. Moreover, the fact that Islam prescribes such harsh penalties for doubters suggests that the faith itself is not intrinsically convincing. As the Ayatollah Khomeini once said, “People cannot be made obedient except with the sword.” Any religion that needs so many external incentives—swords behind you, and virgins in your future—cries out to be questioned. Unfortunately, instead of exploiting its theological weaknesses the West insists on chivalrously shielding Islam from the kind of scrutiny that the West reserves for its own institutions and traditions. And with good reason. Because it’s generally understood, though rarely said, that Muhammad’s claims would not meet the tests of critical reason and historical evidence that we apply to the Judeo-Christian revelation. The much revered sufi theologian al-Ghazali wrote, “The dhimmi is obliged not to mention Allah or his Prophet…” You can see why. Curiosity didn’t kill Christianity, but curiosity would almost certainly kill the Caliphate—or, in our times, the hope for a resurrected Caliphate. Obliged not to mention the Prophet? Given the threat Islam poses to the world and to Muslims themselves, it’s beginning to look as though the obligation runs the other way. The world needs to take a much closer look at the Prophet and his claims. The Prophet is Islam’s main prop. If he is discredited, Islam is discredited. Hence, the mighty efforts by the OIC to make it a crime to blaspheme a prophet. The Prophet’s integrity is not the only thing in doubt. Theologically speaking, Islam is a house of cards. The whole faith rests on the belief that Muhammad actually received a revelation from God. But where’s the proof? Were there any witnesses to this revelation other than Muhammad? Why should we take his word for it? Why were there so many revelations of convenience that worked directly to Muhammad’s personal advantage? Are there really dozens of renewable virgins awaiting young warriors in paradise, or was this revelation simply a clever recruitment tool manufactured by Muhammad to provide an incentive for following him? And why is the Koran, despite its flashes of poetic brilliance, put together like a soviet-era automobile? As an exercise in composition the Koran would not pass muster in most freshmen writing courses. Why can’t God write as well as the average college student? Ordinarily it’s not a good idea to go around questioning other people’s firmly held beliefs. But these are not ordinary times, and Islam is no ordinary religion. As any number of observes have noted, it’s partly a religion and partly a supremacist political ideology—although no one seems to be able to say exactly what percent is political ideology and what percent is religion. Is it 50/50 or 60/40 or 80/20? Is it legitimate to criticize the political part of it, but not the religious part? How do you tell where the politics leaves off and the religion begins? Or are they so bound together that they can’t be separated? If you remember “Joe Palooka,” the old comic strip series about a decent but not-too-bright heavyweight boxer, you might remember that one of Joe’s craftier opponents once tattooed his rather expansive stomach with the word “Mother” inscribed within a large heart. His midsection was his weak spot, of course, but he knew he could count on Joe to avoid hitting him there, Joe being too much of a gentleman to do otherwise. In On the Waterfront, Marlon Brando’s character refers to the place where failed fighters go as “palookaville.” Currently, our whole culture is in danger of ending up in “palookaville” because there are large areas of Islam we decline to examine out of a sense of delicacy that would be excessive in a Victorian matron. Islamic strategists are counting on polite Westerners not to hit them in their soft spot. Islamic strategists invoke the supremacist principles of the Koran in order to stir up aggression against the Muslim world, yet any criticism of Islam is met with cries of, “No fair! You are blaspheming a prophet and his religion.” So far, the shame-on-you-for-criticizing-a-religion strategy has worked very effectively. Fortunately, a few, like Fr. Botros, aren’t buying into the ruse. He has enough respect for Muslims as individuals to realize that their religion should not be put beyond discussion. Many Muslims, especially Muslim women, suffer a profound sense of desperation: the feeling of being trapped in a 1400-year-old nightmare, with no way out. It’s difficult to see any convincing argument for propping up the system that oppresses them. On the contrary, it seems almost a duty to undermine that system—political and religious—and call it into question at every turn. In past ideological struggles we wisely sought ideological victory—the discrediting of the belief system that inspired our enemies. Because the driving force behind Islamic aggression is Islamic theology, it makes no sense to treat Islamic theology like a protected species. Rather, we should hope that Muslims lose faith in Islam just as Nazis lost faith in Nazism and Eastern-bloc Communists lost faith in communism. Of course, it would be all the better if, like Fr. Botros, we had something to offer them in its place. Winston Churchill once said that Greer Garson, for her role in Mrs. Miniver, was worth six divisions in the war against Hitler. It seems safe to say that Fr. Botros, for his role in instilling doubts about Islam and giving Muslims something solid in its place, is worth at least a couple of Departments of Homeland Security. William Kilpatrick’s articles have appeared in FrontPage Magazine, First Things, Catholic World Report, National Catholic Register, Jihad Watch, World, and Investor’s Business Daily. Because you asked! Here is the full video of my remarks at the Tennessee Tea Party coalition on May 22. Despite the threats and intimidation of Islamic supremacist, Hamas-linked CAIR, the Tennessee tea party patriots stood by me, called CAIR a hate group, and did not cancel my appearance. For several days last week, as the flotilla approached Gaza, Israel issued warnings that the ships would not be permitted to reach their destination without first submitting to an inspection of their cargoes – to ensure that no weaponry was being transported. But when the respective crews of the vessels refused to comply, Israeli commandos took action and intercepted the flotilla in the early morning hours of May 31. The IHH-affiliated activists responded with violence, instantly attacking the commandos with knives and clubs, and throwing one of them overboard. In the melee that ensued, ten activists were killed and seven Israeli soldiers were wounded. How could this be? How can we be expected to believe that a well-meaning “humanitarian relief” group would ever behave in a manner that might provoke violent reprisals from Israeli troops? A more thorough examination of IHH’s history and affiliations explains everything. While IHH is indeed involved  in the aforementioned humanitarian endeavors, its overall objectives are much broader. Belying the dove of peace  whose image appears on its logo, IHH overtly supports Hamas , is sympathetic  to al Qaeda , and maintained regular contact with al Qaeda cells and the Sunni insurgency during the bloodiest stretches of the Iraq War. Moreover, IHH has supported jihadist terror networks not only in Iraq, but also in Bosnia, Syria, Afghanistan, and Chechnya. According to  Carnegie Endowment analyst Henri Barkey, IHH is “an Islamist organization” that “has been deeply involved with Hamas for some time.” A 2006 report  by the Danish Institute for International Studies characterized IHH as one of many “charitable front groups that provide support to Al-Qaida” and the global jihad. Is the IHH beginning to sound less and less like a “humanitarian relief” group? Let’s look a little deeper still. According to a French intelligence report, in the mid-1990s  IHH leader Bülent Yildirim was directly involved in recruiting “veteran soldiers” to organize jihad activities, and in dispatching IHH operatives to war zones in Islamic countries to gain combat experience. The report also stated that IHH had transferred money as well as “caches of firearms, knives and pre-fabricated explosives” to Muslim fighters in those countries. Given this track record, can Israel’s concern about the contents of the IHH flotilla cargoes really be considered excessive or unwarranted? 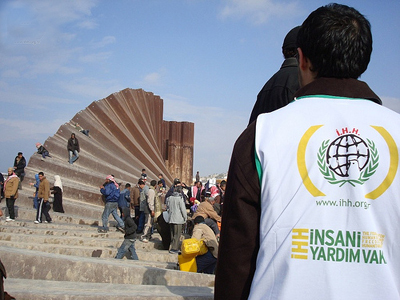 In 1996, IHH continued to burnish its credentials as a “humanitarian relief” organization when an examination of its telephone records  showed that repeated calls had been made to an al Qaeda guest house in Milan and to Algerian terrorists operating in Europe. That same year, the U.S. government formally identified  IHH as having connections to extremist groups in Iran and Algeria. Near the end of 2000, IHH organized protests  against proposals to overthrow that humanitarian icon, Iraqi President Saddam Hussein ; American and Israeli flags were burned at these rallies. During the April 2001 trial  of would-be “millennium bomber” Ahmed Ressam, it was revealed that IHH had played an “important role” in the plot to blow up Los Angeles International Airport on December 31, 1999. Some reasonable observers might contend that to classify such a pursuit under the heading of “humanitarian relief” would require an unduly broad definition of that term. In 2002, investigators found  correspondences from IHH in the offices of the Success Foundation , a Muslim Brotherhood -affiliated organization whose Secretary was Abdul Rahman Alamoudi . For the record: The Brotherhood was the ideological forebear of Hamas and al Qaeda; it supports jihad; and it seeks to impose shari’a law on the entire civilized world. Mr. Alamoudi, for his part, is currently serving a prison term of nearly a quarter-century for his role as a funder of international terrorism. He is best known for having proudly declared himself to be a passionate supporter of Hamas and Hezbollah . The connections to “humanitarian relief” seem rather tenuous here. According to  a report  issued by a website close to Israeli military intelligence: “[S]ince Hamas took over the Gaza Strip, IHH has supported Hamas’ propaganda campaigns by organizing public support conferences in Turkey.” The report also states that IHH continues to operate widely throughout Gaza and to funnel large sums of money to support the Hamas infrastructure. In January 2009, IHH head Bülent Yildirim met  with Khaled Mash’al , chairman of Hamas’ political bureau in Damascus, and Mash’al thanked Yildirim for the support of his organization. This, then, is the IHH: a pack of anti-Semitic supporters of terrorism, cloaking themselves in the vestments of victimhood, and bleating to the world about how unfairly they have been treated by the very nation whose extermination they have worked long and hard to bring about. It’s actually a story that has become quite familiar. “I’m 63 and I’m Tired” — Robert A. Hall is a Marine Vietnam veteran who served five terms in the Massachusetts State Senate. I’m tired of being told that I have to pay more taxes to “keep people in their homes.” Sure, if they lost their jobs or got sick, I’m willing to help But if they bought McMansions at three times the price of our paid-off, $250,000 condo, on one-third of my salary, then let the left-wing Congress-critters who passed Fannie and Freddie and the Community Reinvestment Act that created the bubble help them with their own money. I’m tired of being told how bad America is by left-wing millionaires like Michael Moore, George Soros and Hollywood Entertainers who live in luxury because of the opportunities America offers. In thirty years, if they get their way, the United States will have the economy of Zimbabwe , the freedom of the press of China , the crime and violence of Mexico , the tolerance for Christian people of Iran , and the freedom of speech of Venezuela . I’m tired of being told that “race doesn’t matter” in the post-racial world of Obama, when it’s all that matters in affirmative action jobs, lower college admission and graduation standards for minorities (harming them the most), government contract set-asides, tolerance for the ghetto culture of violence and fatherless children that hurts minorities more than anyone, and in the appointment of US. Senators from Illinois . I’m tired of being told that out of “tolerance for other cultures” we must let Saudi Arabia use our oil money to fund mosques and mandrassa Islamic schools to preach hate in America , while no American group is allowed to fund a church, synagogue or religious school in Saudi Arabia to teach love and tolerance. I’m tired of people telling me that their party has a corner on virtue and the other party has a corner on corruption. Read the papers; bums are bipartisan. And I’m tired of people telling me we need bipartisanship. I live in Illinois , where the “Illinois Combine” of Democrats has worked to loot the public for years. Not to mention the tax cheats in Obama’s cabinet. I’m tired of hearing wealthy athletes, entertainers and politicians of both parties talking about innocent mistakes, stupid mistakes or youthful mistakes, when we all know they think their only mistake was getting caught I’m tired of people with a sense of entitlement, rich or poor. Yes, I’m damn tired. But I’m also glad to be 63. Because, mostly, I’m not going to have to see the world these people are making. I’m just sorry for my granddaughters.